1. Centralia, Pennsylvania : At one time, the tow­n of Centralia, Penn., supported almost 3,000 residents, with stores, churches, hotels and bars. It was a boomtown, established in 1866 and built from the profits of coal mined out of the Pennsylvania hillside. It was this same coal that led to Centralia’s almost complete demise. City workers burning trash in an open pit in 1962 accidentally lit a vein of anthracite coal, part of the vast deposit that lay beneath the town. Once lit, the coal carried the flames to adjacent veins and deposits, eventually causing a huge underground coal fire. The city tried for years to put the fire out. Techniques like mining burning coal, digging trenches to cut the fire off from the rest of the coal beds, and dousing the embers with water all failed to produce the desired effect. Officials concluded the best chance to save the town was to dig an extensive network of trenches to isolate the hot spots. The exorbitant cost of the undertaking kept the plan from ever coming to fruition. The tourist resort of San Zhi, Taiwan, was an ultra-modern development created by the Taiwanese government in the early 1980s. Its unique, podular structure were never enjoyed, however it was abandoned before it was ever inhabited. Western expatriates living in Taiwan report a string of job-site deaths that led to the idea that the development was haunted, which left it unused. In 1981, with the fire burning steadily for almost 20 years, the last straw came for most of the town’s residents. A 12-year-old found the ground beneath his feet had literally opened up. T­he boy managed to grab onto a root and was rescued by his cousin from the 150-feet deep sinkhole filled with poisonous carbon monoxide. The federal government allocated $42 million for the re­location of Centralia’s residents in 1982, essentially declaring the town a lost cause. Most Centralians took the offer of help, leaving the town almost entirely abandoned. A few chose to stay; around 20 residents remain in Centralia as squatters in what were once their legitimately owned homes. The government closed the main egress into town, Route 61, detouring traffic, and effectively cutting off the burning town and its remaining inhabitants from the rest of the world. Those roads that haven’t been reclaimed by vegetation are buckled and cracked, with white noxious gas spewing from underground. Most of the buildings either caught fire or were leveled to keep them from burning. The town’s cemetery and a few houses, some still inhabited, remain. 2. 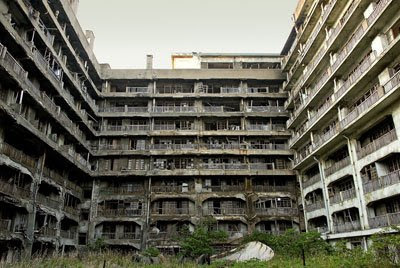 Hashima Island, Japan : One of the sagging apartment blocks on Hashima Island, Japan. At one time, units like this housed inhabitants of the most densely populated city on Earth. Hashima Island is a small, 15-acre outcropping of rock off the coast of Nagasaki, Japan. Although tiny in size, the island was important in magnitude: It was a major coal mining center for Japan for almost a full century. The island sits atop ­a coal deposit that descends well into the ocean floor beneath. Once it was tapped, Japan’s Mitsubishi Corporation purchased Hashima from the local families who owned it in 1890. That's when the heyday of Hashima Island began. Since it’s located about 18 miles from Nagasaki, it made more sense for Mitsubishi to build housing on the island, rather than ferry its employees to and from the island every day. Squat concrete apartment blocks were constructed one at a time. Space was at a premium, so the buildings went up instead of out, and families were jammed together in cramped lodging, sharing bathrooms and kitchens. Amenities like a movie theater, doctor’s office, arcades, restaurants and bars were added later, and the city became a thriving, microcosmic community. The entire complex was linked via underground tunnels. At its peak in 1959, Hashima Island was the most densely populated city on Earth, with 5,259 inhabitants on the small, rocky outcropping . After World War II, employees found their lives on the island much improved. Modern luxuries like televisions, radios and the movie theater were introduced post-World War II. And the formerly unvegetated island sprang to life with rooftop gardens planted and maintained by the island’s employee-residents. The golden age of Hashima Island was pretty short-lived, however. In January 1974, with petroleum supplanting coal as the world’s preferred energy source, Mitsubishi revealed the mine would be closed. By the following April, the last of the island’s residents were ferried onto the mainland, and the island was permanently closed. The structures of the island are in remarkably good shape, considering their more than three decades of neglect. Some stone walls have caved and crumbled, but the concrete structures remain largely intact. Windows are broken and railings along the apartment’s balconied corridors are in a dangerous state of disrepair, but corridors within the company’s offices are surprisingly undamaged. The city continues to sit silently offshore, an abandoned ghost island, its only inhabitants stray cats and the occasional illegal visitor. The island may enjoy more visitors in the future, though. Japanese officials have applied to make Hashima Island a World Heritage Site . 3. (Parts of) Detroit, Mich : The arcade with a view of the ticket counters at the abandoned Central Michigan Depot in Detroit. Some modern abandoned cit­ies are actually parts of functioning cities. 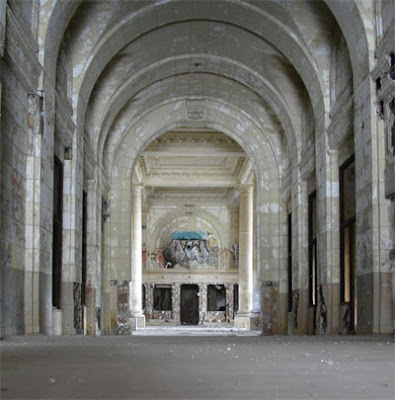 Perhaps the best example of an abandoned district is found within Detroit. The Motor City ­gets its name from its former role as the world’s seat of the automotive industry. Henry Ford’s refinement of the assembly line led to cheaper, mass-produced cars and trucks in the 1920s, and the city expanded quickly. By the 1950s, Detroit, with its two million residents, was America’s third-largest city. With employment rates and income high in the area, opulent buildings began to dot downtown Detroit’s skyline. Ornately detailed architecture adorned the city’s theaters and office buildings. It was a bustling city, and its buildings reflected the power and the wealth the automobile industry accumulated. By the 1970s and '80s, however, the American auto industry entered a decline. Detroit, inextricably attached to car manufacturing, reflected this downturn. In 1979, Detroit’s Big Three carmakers (Chevrolet, Ford and General Motors) produced 90 percent of all of the vehicles sold in the U.S.; by 2005, that figure was down to 40 percent. Since Detroit was something of a boomtown -- based on cars, not gold -- it couldn’t help but suffer when car manufacturers faced competition from overseas automakers. But it wasn’t only competition from foreign car manufacturers that led to the demise of downtown Detroit. Suburbanization played a role as well; as people began moving out of the city, their money went with them. The same holds true for the carmakers. Automotive factories became bigger as the car boom went on. With land in the city at a premium, car companies built newer, bigger facilities in the suburbs. Whole sections of Detroit were left abandoned, while in other cases, slumping buildings sat empty alongside struggling buildings that remained open. Detroit began to crumble. Building owners simply left their investments to decay once they found they couldn’t lease or sell them. Others tried to revitalize or redevelop buildings into new businesses; for example, some stage theaters found new lives as movie theaters. Ultimately, a lack of customers caused many buildings to simply be abandoned. For years, office buildings, hotels, churches, theaters, homes, factories and stores were boarded up and left to rot. Vandals broke windows, spray painted messages and picked mementos from the architecture. Within these buildings, sunlight streams through cracks. Old furniture is overturned in unused hotel rooms. Desks still stand in empty offices. Even the city’s old train depot -- a massive, 18-story transportation hub -- has been abandoned, its intricate shell a reminder of its past importance. 4. Humberstone and Santa Laura, Chile : Inside the school in the abandoned saltpeter mining town of Humberstone, Chile, taken July 2006. 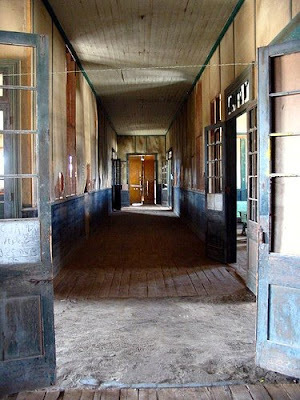 Humberstone, Chile, was founded in 1862 as the nitrate mining center of Oficina La Palma. In 1925, it was renamed Humberstone after the British mine manager who bolstered the small town's wealth . Both Humberstone and nearby Santa Laura boomed together from their shared nitrate production. The towns saw their heydays as a combined nitrate mining and processing center in the 1930s and '40s . Nitrate is an essential ingredient in fertilizer, but in the '30s, a cheap synthetic substitute was create­d, effectively rendering nitrate (also called saltpeter) obsolete. With the need for mined nitrate diminished, the towns of Humberstone and Santa Laura began to decline alongside the industry they were built on. The towns suffered a slow demise, taking three decades to become completely abandoned. It wasn’t until 1961 that the factory offices (which had continued to support a handful of residents) shut down completely. The towns were left to sit as they were when the last residents left, the dry sand from the encroaching desert drifting through the abandoned school and the theater. At the factories, the machinery remains and the workers’ houses are around today, although a bit worse for the wear. The Humberstone hotel's swimming pool is drained now, but its diving board is still in place. 5 . 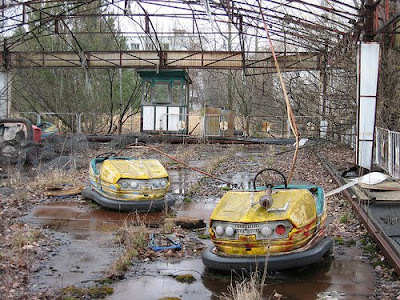 Prypiat, Ukraine : The bumper car ride in the abandoned city of Prypiat, evacuated after the 1986 Chernobyl power plant explosion. 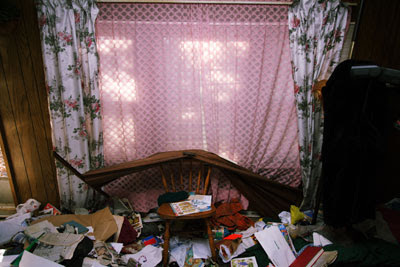 On April­ 26, 1986­, an explosion occurred at the No. 4 reactor of the nuclear power station at Chernobyl, in the Soviet state of Ukraine. It was the worst disaster in the history of nuclear energy production. The radiation spread by the explosion resulted in thousands of deaths in Ukraine, Russia and surrounding nations by 2006. Soviet officials were criticized for not moving quickly enough to warn residents of the danger. Cities were eventually evacuated, and the government constructed an 18-mile exclusion zone -- a closed-off area surrounding the decommissioned power plant . Fastest Time To Boil Water Through Body !! What The Hell Is This ?? !!! Top 10 Famous Paintings In LEGO - Amazing ! !